One of the joys of having plenty of time in an Italian city is the opportunity to simply wander. Strolling through vibrant neighborhoods and discovering for oneself a fountain, piazza, church, cafe, monument, garden, or historic building is a wonderful experience. Stumbling into an unexpected and intriguing street scene, full of Italian chatter and maybe even some music, is the stuff of Italian daydreams. Getting lost, and finding your way back to a familiar landmark, is part of the fun. But still, even an inveterate wanderer sometimes needs a map. Maps provide more than just direction; they can give context to a place, delineate neighborhoods, link important landmarks (rivers, bridges, buildings) to discoveries made while wandering, and provide a quick and efficient orientation to a new place. A good map is a treasure. When visiting larger cities, it's fairly easy to find a detailed map, or a good guidebook. There are so many choices for Rome or Florence that it's easy to find just the right one to suit any need. But in the smaller cities, places less visited by tourists, finding a good map can be a challenge. I certainly found this to be true when I first visited Lucca. The American guidebooks devoted just a quick page or two to Lucca, seemingly an afterthought in a guide otherwise devoted to Florence. If a map was included at all it showed just a few main streets and sites. I found better guidebooks in the local bookstores once I arrived, but the maps available were still small and lacking in detail. I often found myself wandering down a small vicolo (lane) that I simply could not locate on any of the available maps, or looking at a marvelous building, garden, or church with no idea of what I was seeing. And then, several years ago during an online search before a return visit to Lucca, I stumbled across The Wanderer's Map of Lucca and it's accompanying guidebook, "The Wanderer's Guide to Lucca." Both map and guidebook were written by Brian Lindquist, an American who came here for a visit and, in his own words, "got waylaid." How fortunate for us that he did, because he has written what I consider to be the essential tool for getting to know Lucca. The book is divided into sections that cover the history of Lucca, the churches, the palazzi, the families who played an important role in the history of Lucca, the city streets, and the three generations of city walls. The book is a fascinating and informative read for those who want to dive deep into the history of Lucca, those who love its Medieval streetscapes and architecture (count me among them), and anyone who has looked at a structure such as the Torre Guinigi (Guinigi Tower) and wondered who the heck those Guinigis were and why they have a tower named after them. Readers interested in art history will also find the information about art, especially the art original to the many churches, invaluable. But the map - or should I say THE map - is an essential tool for getting to know Lucca. My copy is so creased and worn after accompanying me on many trips that I recently ordered a new one. I now have one to bring with me and one posted on a wall in my house to feed my recollections, mental meanderings, and daydreams! Why is the Wanderer's Map so important? To begin with, it's big (19 x 26 inches) and easy to read. 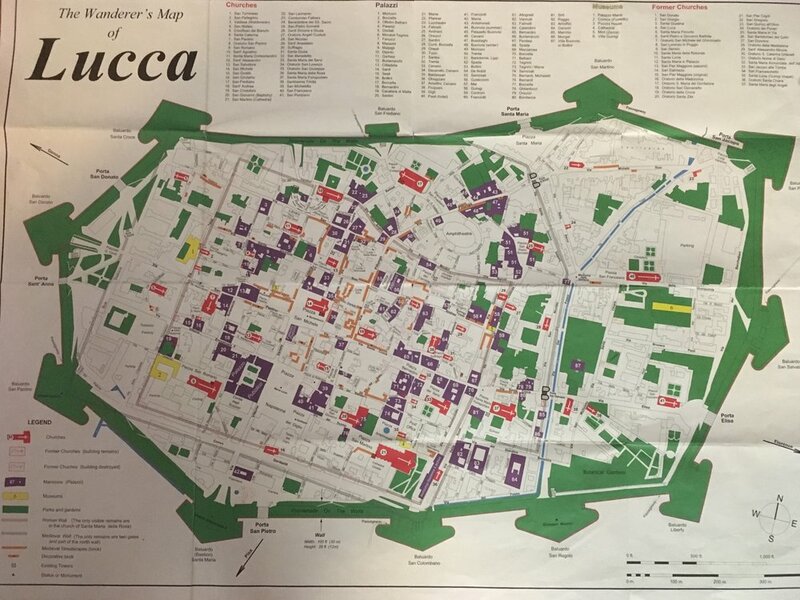 It shows the important features of Lucca, including the footprint of all 3 walls (Roman, Medieval, and Renaissance) and all the streets, from main drag Via Filungo to the smallest vicolo. The existing churches are shown as are the locations of churches that used to stand but are no more (Lucca used to be called the City of 100 Churches; today there are about 40 within the 2.5-mile circumference of the city walls). Each palazzo is named and its location shown. The map key is clear and easy to use - in the section pictured below, churches are in red, palazzi in purple. The orange lines signify Medieval streetscapes. Flip the map over to find that it is annotated (linked to the numbers shown on the map below), giving information about each church, the walls, and the families whose names still are important in Lucca, as seen in the many local streets and palazzi that bear their names. The map and guidebook are my companions in Lucca. They provide a wealth of information and inspiration. I love having at my fingertips a resource that tells me that the church of Santa Caterina, one of the recently restored small churches in Lucca, was built in 1575 or that San Giovanni e Reparata church (shown in the photo below) once housed the relics of St. Pantaleone. My visiting friends tell me that I make a good tour guide - if so, it is thanks in large part to all that I have learned from the Wanderer's Map and Wanderer's Guide to Lucca. Both map and guidebook are available from Lindquist Historical Guides, Inc. 119 Midland Street Bridgeport, Conn. 06605 or oline from www.lindquistguides.com. The book with a copy of the map is available for $27.95 (includes shipping); map alone for $9.95. Note that they only ship to addresses within the United States. Book without map is also available on Amazon.